Will 'Les Misérables' Virgins Enjoy The Movie? I was dreading the film version of Les Misérables. Absolutely dreading it. Do you want to know how much I was dreading Les Misérables? I put the word "dreading" in italics two sentences ago to emphasize just how much I was not looking forward to watching Les Misérables. Sure, I wanted to be there when it screened at Alice Tully Hall on the Upper West Side of Manhattan this past Friday afternoon -- but that's because I knew that, given its Oscar prospects, I would have to see it eventually. Basically, I wanted to get it over with. The truth is, I don't have much against Les Misérables. (Though I do wish someone would decide if the abbreviation should be spelled "Les Miz" or "Les Mis," because I see both. A lot.) It's more that I knew almost nothing about Les Misérables. And I was embarrassed about that. My full knowledge of Les Misérables stems from an episode of Seinfeld called "The Jacket," in which George Costanza repeatedly sings the lyrics to "Master of the House" because they are stuck in his head. (Not surprisingly, the "Master of the House" scene featuring Sacha Baron Cohen as Thénardier and Helena Bonham Carter as Madame Thénardier was my favorite in the film, if only because I had heard that song before.) But I had always thought of Les Misérables as something that was (A) kind of complicated, (B) beloved by a lot of people and (C) impossible for me to catch up on at this point in my life. It would be like deciding all of a sudden, "You know, maybe it's time I took up polo." I saw Les Miz in the absolute best environment possible. First, the film's director, Tom Hooper, personally introduced the film by informing the audience that we'd be the first people anywhere to see the final version. Plus, cast members Anne Hathaway, Amanda Seyfried, Eddie Redmayne and Samantha Barks were there, too. That has an effect on a crowd. And, boy, was this a fun crowd to watch Les Misérables with. I mean, this crowd was as pro-Les Miz as they come. After each musical performance -- which, Hooper explained, were sung as they were being filmed instead of being overdubbed -- the audience applauded. Every performance. Basically, I was surrounded by the hoity-toity Les Miz people I that I used to fear and despise, and -- Les Miz virgin that I am -- I was a bit swept up in their excitement. But! I will say that my lack of knowledge of (and borderline ignorant contempt for) the source material offset the atmosphere. 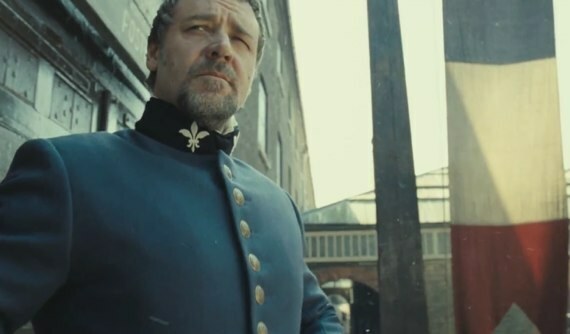 In the end, I found Les Miz to be a pretty wonderful (there's that word again), surprisingly accessible movie. A movie, I should add, that made my editor cry. (Another caveat: he's one of those Les Miz nerds, and he admitted that he would cry before the movie even started.) For the record: I did not cry. If you're like me (and, if so, may God have mercy on your soul) and worry that you won't enjoy Les Miz because you're not familiar with the source material, do not let that keep you away. No longer shall I fear the words Les Misérables -- which will be spoken many, many times during the Academy Awards. From this day forward, when I hear the name Jean Valjean, I will know who that is. And, best of all, I shall forever enjoy a deeper appreciation of "The Jacket" episode of Seinfeld.